Students express their initial impressions of the medieval period. Then, they gain information from a video and a text on major medieval institutions including feudalism. They explain the causes and effects of the growth of medieval cities. Finally, they discuss whether they would have wanted to live in medieval times, and why. In this experience, students express their initial impressions of the medieval period. Then, they gain information from a video and a text on major medieval institutions including feudalism. They explain the causes and effects of the growth of medieval cities. Finally, they discuss whether they would have wanted to live in medieval times, and why. Describe the social, political, and economic development of medieval Europe. Define and explain the influence of feudalism in medieval Europe. 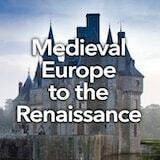 Explain the increase in trade and the growth of cities in medieval Europe. 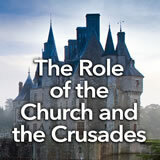 In this experience, you’ll delve into the political, social, and economic forces that shaped medieval Europe. When people hear the words “medieval” or “Middle Ages,” they often visualize a time of ignorance and poverty, a time between the glories of the ancient Roman world and the innovations of later European civilization. But in fact, the Middle Ages were a time of change and growth. Visualize the medieval period—the Middle Ages. Write words or brief phrases describing what you see. Discuss student responses. If students feel stuck, recommend that they look at the illustration in this scene for ideas. Possible words and phrases include, but are not limited to: knights, castles, King Arthur, serfs, and churches. The Complete List of Learning Experiences in Medieval Europe Unit.